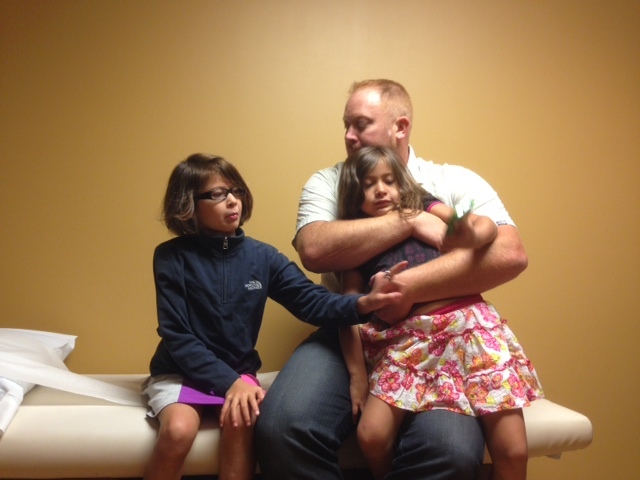 Yesterday morning we had an appointment with Dr. Nelson. We were very excited for the appointment. Its been over a month since Amaya's hip started bothering her. The appointment almost didn't happen. Josh's school district changed their insurance companies this year so as of July first we had a new carrier. Even though we had the appointment set for months I knew we wouldn't be seen without insurance referrals in place. So on the first I made some calls to our wonderful referral coordinator, Marilou. Marilou was helpful and rushed the referrals so that everything would be in place for our appointment. She even emailed me a copy of the fax she sent over and of the referral in case we had any problems. On Wednesday, the day before the appointment, I got a call telling me that since Amaya had no insurance or referral her appointment would have to be rescheduled until mid August. I was devastated. I fought back tears and curse words. 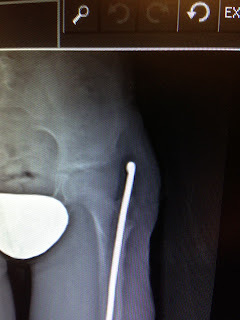 I inhaled deeply then explained that this wasn't a normal appointment that could be postponed, but that my daughter was in pain and discomfort because of the rod sticking out of her femur. I talked with three different ladies for forty five minutes. They were sympathetic and helpful. Thanks to Marilou's email they were able to track down the fax and process it immediately. The referral center receives thousands of faxes per day, but since I knew the exact day and time the fax was sent they were able to track it down and process it. I thanked Amanda and Lina for all their help. No words could express how relieved, happy and grateful I was. I also called Marilou to thank her for her emails as without them we would be waiting another month to be seen. Referrals can often take you on a roller coaster ride of emotions: desperation, frustration, fear, sadness, anger, hope, joy, gratefulness. It's exhausting, but rewarding. The appointment was great. We had two new residents work with us. One was a female and she was excited when we mentioned that Amaya wants to be an orthopedic surgeon herself. She was kind and encouraged Amaya to never give up on her dream. 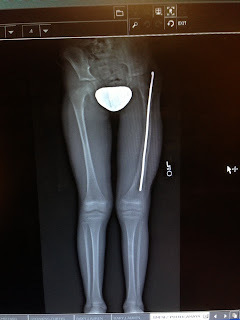 While the residents looked at Amaya's x-rays they took measurements of her leg lengths (there's only about a 1 cm difference between both legs right now), the angles in her knees, etc. The residents seemed interested and happy with Amaya's x-rays. 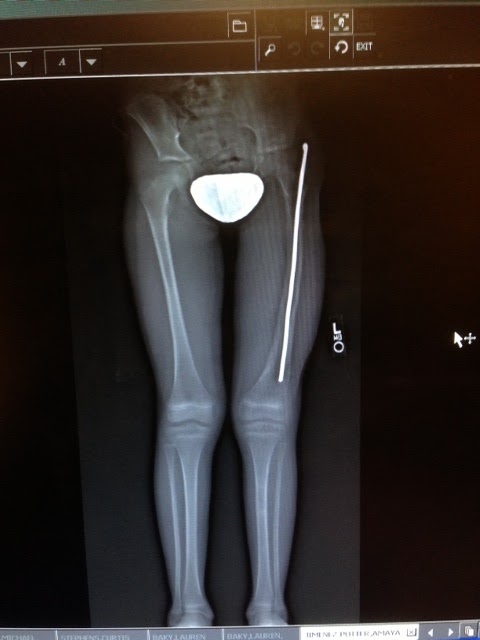 When Dr. Nelson came in he looked at her x-rays and said since her femur looks good we'll schedule the rod removal. He was happy with how well her femur has healed. He was kind and told the residents that the lengthening "was a team effort." I appreciated the time he took to show Amaya what and how he would remove the rod. His kindness helped calm her nerves. He said its an easy out patient procedure. Once the rod was taken care of I asked about the next lengthening. Dr. Nelson said that the soonest he could put in the internal lengthening device would be when Amaya is ten years old. He said he'll watch her as she grows. Then as her discrepancy continues to show we can decide when to do the lengthening. He said that the femur grows about one centimeter a year and that her next big growth spurt should be between the age of ten to twelve. So, we'll have about three to five years without any surgeries. I could barely believe my ears. No surgeries?! 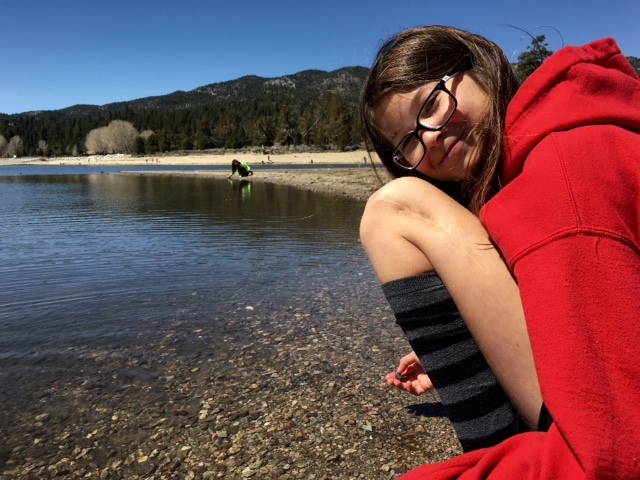 In the past two years Amaya has had three surgeries (four counting the upcoming rod removal). It's hard to imagine life without a surgery, or upcoming surgery, or recovering from a surgery. But, I am very much looking forward to that. Life without surgeries sounds wonderful. I don't want to sound too dramatic, after all four isn't very many. But, then I realize that I know many people who have never had four surgeries in their entire lives, yet she's had four in her seven and a half years of life. And she's been such a trooper too! Before we left we got our surgery date scheduled. On August 15 the rush rod will be removed. Its nice to have a date: knowing the pain will soon be over. I was happy that Amaya will have two weeks to recover before school starts. She was happy that she will have a month to recover before her eight birthday. Thanks for all your care and concern. Keep Amaya in your thoughts and prayers, she's still in discomfort and nervous about having another surgery (she's dreading the IV). I'm a little worried about the rod being taken out: just lots of "what ifs" running through my mind. Being silly while waiting in an exam room. Here's a close up of Amaya's hip. Here's a full leg length view. Here's a short video of a trick Amaya taught herself on our family trip this summer. Even though the rod is bothersome and at times painful, she doesn't let it slow her down or stop her from enjoying life. Christa thanks for your kind words, reading along and sharing in our joy of no more surgeries for a few years! To be honest, I'm not sure how I kept my composure. I guess I've had lots of practice these past eight years.